If you have children and want to teach them various things about math or vocabulary, a very good and efficient solution is to use flashcards. Thus, they will be able to learn new things in a fun way and will also make the learning process much more efficient. The problem is that it's really difficult to design flashcards without using a specialized computer application for this purpose. 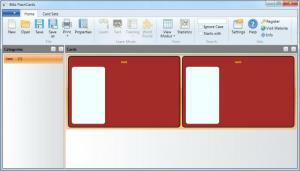 A program which allows you to design any card or flashcard is Blitz FlashCards. Installing this Windows application shouldn't be a problem for most users, as the process is intuitive. After installing and launching the program, the user will be presented with a graphical interface, which features simple controls, making the interface of Blitz FlashCards easy to get familiar with. The first thing to do is to create a new category for the flashcards, according to their type. After creating the category, one will need to create the group of flashcards and give a distinctive name to each of them. Each flashcard can contain various images and sounds and Blitz FlashCards offers support for a wide range of graphical and audio file formats. An unlimited number of flashcards can be created for each category. Besides that, the program allows importing flashcards from other applications, like MS Excel or CoboCards. After the cards have been created, the user will be able to save them as a project file or print them directly using any regular printer. It allows you to create any kind of flashcard, containing images and sounds. Besides that, each card can be placed in a specific category. Furthermore, the user can import flashcards from other applications. The types of media elements that a flashcard can contain are a bit limited. Blitz FlashCards allows you to easily create any kind of flashcard using an intuitive interface and a large number of options. You can download Blitz FlashCards free here.